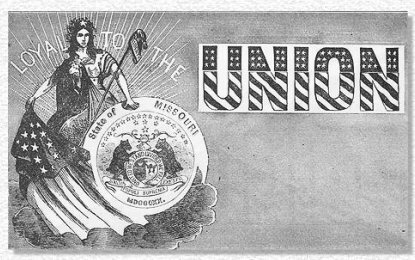 Following are bits and pieces from St. Louis, Missouri newspapers, the Missouri Republican and the St. Louis Democrat, from the Civil War years. These aren’t the world-shaking big news articles, just the tidbits that give the flavor of the city during the war years. As you read, bear in mind that St. Louis was under martial law and the newspapers were censored by the military authorities. The editors could only print approved news or risk imprisonment and confiscation of their papers. From scanning through the newspapers, it seems the city during the war years averaged about two to three murders per week. During the summer months about two young boys per week drowned in ponds or the river. There was a “floater” found in the Mississippi river every couple days. Infants and small children were routinely found abandoned. The people were decidedly not what we think of as Victorians. Cuss words were unabashedly used in the newspapers (yet if you read some from the 1880s cuss words are censored out). Ads for sexual problems and sexual diseases were very blunt and explicit. The flavor of the times was one of a busy, bustling, very alive city that was also more than a bit dangerous. Articles are in no particular order. Pictures are not from the newspapers–they had no pictures in them. 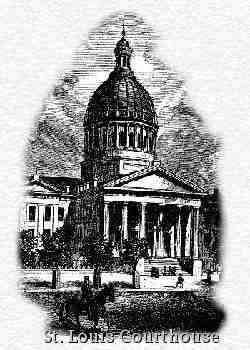 October 17, 1862We Thursday noticed the arrest of A. J. Ham, cashier of the Bank of St. Louis, by order of Colonel McConnell. 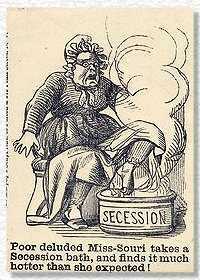 Mr. Ham is charged with endeavoring to procure secession songs, for the purpose of circulating them, and thereby doing injury to the Union cause. The market to-day was flat. The impression that the government is now going to enforce the long talked of blockade, deterred buyers from coming forward, and produce for the South is not in demand. 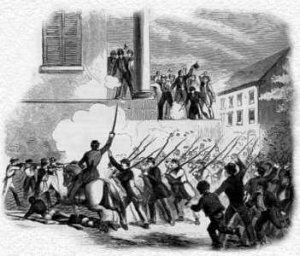 This movement, as a military necessity, is unquestionably wise; but locally in St. Louis, it will be rather a severe blow at this time. The idea, however that those who will be affected adversely will be driven into the rebel ranks, is too preposterous for sensible people to entertain for a moment. LEAD—This article being now contraband of war no shipments are making and we are without quotations. CORN—Buyers seemed to be afraid to take hold, and the market dragged heavily. August 29, 1864Draft! Draft! !—Cavender & Rowse will insure against the draft for one hundred dollars. Call and see them at No. 58 North Third street. April 26, 1863For the Murder of His Wife—Daniel Miller, the rag-picker, who murdered his wife last Thursday week, was yesterday fully committed to jail by the Recorder, to await the action of the Grand Jury on his case. The Recorder decided the case was not bailable. September 26, 1862Appointment—Major Samuel T. Hatch has been appointed by General Gray Assistant Provost Marshal General in his department. September 7, 1862Inquest—The Coroner held an inquest yesterday in view of the body of Patrick Kerrigan, found drowned in the river. Deceased was a laborer, and leaves a family residing on Cherry street, between Main and Second. September 4, 1862Mrs. Sappington Banished—Mrs. Drusella Sappington, at whose house the rebel Col. John C. Boone and staff were recently found quartered, has been ordered to leave the State without unnecessary delay, and to remain absent till permitted by United States military authority to return. Mrs. Sappington’s residence is twelve miles from the city, between the Manchester and St. Charles roads. She is the wife of W. D. Sappington, who has left his farm and family in that locality, and joined the rebels. Mrs. Sappington is a daughter of Judge Olly Williams of St. Louis county. September 7, 1862—Saturday—The cases before the Recorder Saturday morning were few in number and of no interest whatever. October 5, 1864The Rainy Season—The rain, which would have been so timely in June last, is now coming down in profusion, with no prospect of a let up for some days. This dispensation will, however, have its good effects in filling the well, streams, ponds and springs, and will give a start to the grass, which will for some time yet, till winter, furnish to cattle a pasturage that will make the farmers’ winter feed go further. 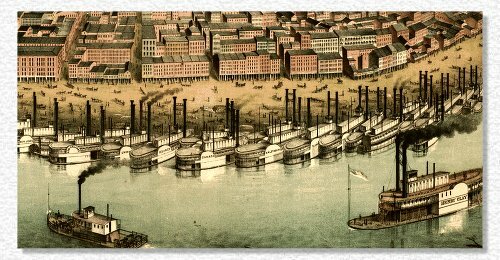 September 7, 1863Prisoners—The steamer Wm. L. Ewing arrived yesterday from Memphis, with 138 Confederate prisoners, en route for Alton. We understand they went to Alton on the cars. May 5, 1864Fat Children—Those of our readers who love fat babies should call and see the fat children exhibited by Mr. M. Stone; on Fifth street near Washington avenue. The boy, who is 12 years of age measures 5 feet 3 ¼ inches around the body. The girl, six years of age, measures 4 feet 6 inches around. The New Low Pressure Sidewheel Steamer Traveler, will make four Grand Excursion trips from Detroit to Lake Superior, during the months of July and August. 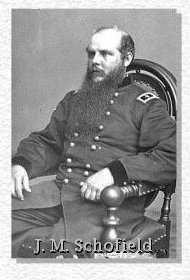 September 19, 1862Departure of General Schofield—Gen. Schofield will leave for Springfield this morning at 10 o’clock. August 25, 1862United States Police Matters—Rigid measures are being taken to enforce the order regarding places of business. Ten saloons and one beer garden were closed yesterday for remaining open between the hours of four and seven P. M. Captain Tunnecliffe, Chief U. S. Police force, returned Saturday to the city, after an absence of ten days at Buffalo. April 26, 1863Recovery of the Body of Wat. Sullivan—The body of Wat. Sullivan, drowned in a pond on Cass avenue, Friday evening, was recovered yesterday morning. The Coroner held an inquest in view of it yesterday. Only one of the horses attached to the wagon was drowned. The bond of Andrew Welch canceled, as he was sworn into the service of the United States. Samuel Tylor, paroled for ten days, to remain within the limits of the city, to attend his wife, who is dangerously sick. September 4, 1864Highly Important To Invalids—Dr. C. H. Woodhull, the king of cancer and chronic disease doctors, has located his office and residence at No. 41 Fourth street, near Elm, where the afflicted can be insured of a safe and certain cure. He is the only Doctor living that can kill and extract a cancer in twenty-four or forty-eight hours, without instruments, pain, or the loss of a drop of blood; and challenges the world to produce remedies equal to his in removing cancers, diseases of the heart, lungs, chest, throat, liver, stomach, and many others too numerous to mention. 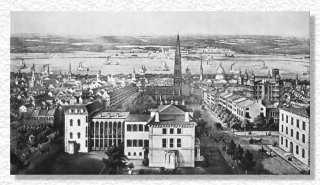 September 7, 1863Concert Hall—No. 49 Market Street—The most celebrated vocalist is now engaged at the above resort and sings every evening. 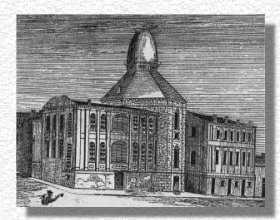 September 7, 1862Prisoners—Seven prisoners arrived from Montgomery county Saturday morning, and were sent to McDowell’s College for confinement. They were recently bound for Price’s army. June 22, 1864Ann Flynn in Limbo Again—The notorious Ann Flynn, who has served several terms in the county jail for petit larceny, was arrested by a policeman yesterday, having in her possession two straw hats and a head of cabbage. Whether she wanted the hats for her own head and the cabbage head was not explained. May 6, 1864Going South—Battery K, 1st Missouri light artillery, Captain James S. Marr, having received a full outfit of guns, horses, etc., will leave in a few days for active service again. December 6, 1862Photographic Albums—A friend told us the best collection of Carte De Visite pictures in the city was at McIntyre’s, No. 9 South Fifth street. He has just received a nice lot more of albums. February 18, 1864Driver of a Coal Wagon Killed—The name of the man who died on Tuesday from the effects of a fall from his wagon the previous night, is Henry Collet. He was from the Illinois coal mines, was about thirty years old, and fell on Second street, between Plum and Cedar. The Coroner held an inquest on the boy, and found that death had been caused by concussion of the brain, produced by the fall. August 25, 1862Prison Inspection—Colonel McConnell on Friday inspected the Gratiot street prison, it having been reported by disaffected persons that it was not properly kept. An examination revealed perfect order, and everything working satisfactorily under Captain Bishop’s management. October 12, 1864Alien Substitutes furnished and three years’ certificates obtained by E. Stafford, No. 30 Olive Street, St. Louis. October 10, 1863One Adam Kurd, colored, was committed to jail yesterday by the Recorder for theft of twenty pounds of cheese from John Massey’s saloon, No. 10 South Levee. May 8, 1864The “Modest” Girl Convicted—Julia Quinn, a good-looking little girl of fourteen—the same whose modest demeanor captivated the committee of the Grand Jury during their examination of the jail—was convicted of grand larceny in the Criminal Court yesterday, and condemned to two years’ imprisonment in the penitentiary. She had been sent to the House of Refuge as a juvenile vagrant, but escaped from that institution, after giving evidence of great depravity, and a few days afterwards was arrested for stealing wearing apparel at a house of bad repute. August 29, 1864Saloon Keeper Jugged—Mr. Charles Shultz was sent to jail yesterday by the County Marshal for failing to pay his dram shop license. October 14, 1862Larceny—Mary King was arrested yesterday for stealing a bonnet and shawl from the house of Mrs. Blake, on Ninth and Morgan streets. The girl was young and intelligent, looking not at all like a thief. She stated that her parents resided on Twenty-fourth and Biddle streets. May 9, 1864The Stars and Stripes Hoisted.—A eleven o’clock this morning an immense United States flag was hoisted oven the Fair Building on Twelfth street. The workmen, guard, and a concourse of citizens assembled, who were addressed briefly and pertinently by Major Alfred McKay. Whereupon, the multitude gave three rousing cheers, which were repeated “with a tiger” and the hammers and saws resuming their busy task, the company separated.